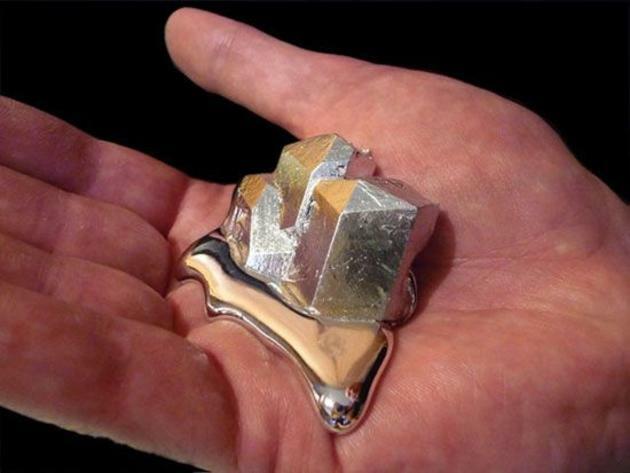 In 1871, existence of gallium was first predicted by Russian chemist Dmitri Mendeleev, who named it "eka-aluminium" on the basis of its position in his periodic table. He also predicted several properties of the element, which correspond closely to real gallium properties, such as density, melting point, oxide character and bonding in chloride. Gallium was discovered spectroscopically by French chemist Paul Emile Lecoq de Boisbaudran in 1875 by its characteristic spectrum (two violet lines) in an examination of a sphalerite sample. Elemental gallium is not found in nature, but it is easily obtained by smelting. Very pure gallium metal has a brilliant silvery color and its solid metal fractures conchoidally like glass. 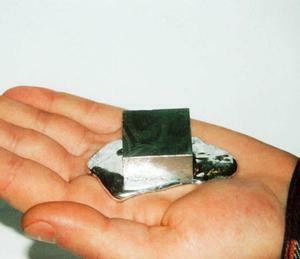 Gallium easily alloys with many metals, and is used in small quantities as a plutonium-gallium alloy in the plutonium cores of nuclear bombs, to help stabilize the plutonium crystal structure. Today, almost all gallium is used for microelectronics (gadgets like your phone, TV's and even cars). Gallium arsenide, the primary use of gallium, is used in microwave circuitry and infrared applications. Take a look at the following video and see this metal in action as it destroys an Aluminum soda can. Unreal! This post has been viewed 61,760 times.